Cote De Moi Embroidered Full Briefs Ladies The Ladies Cote De Moi Embroidered Full Briefs offer a super comfortable fit that is ideal for e..
SoulCal Black Hot Pant Shorts Dress comfortably from the base up with these SoulCal Black Hot Pant Shorts. The underwear features an elasti..
SoulCal Plain Briefs These SoulCal Plain Briefs feature an elasticated waist band with signature SoulCal branding for a great look. > Lad..
Everlast Classic Briefs 2 Pack LadiesThis pack of two womens classic briefs feature a soft cotton construction with a branded, elasticated w..
Everlast Classic Short Briefs 2 Pack LadiesThis pack of two womens short briefs from Everlast feature a comfortable cotton construction with..
Everlast Premium Briefs LadiesThe Everlast Premium Briefs feature a non-restrictive elasticated waistband, with signature Everlast branding ..
Firetrap Thong Briefs Ladies These Firetrap Thong Briefs are crafted with an elasticated waistband made up of 2 straps. They feature a lace ..
Lonsdale Single Short Ladies This Lonsdale Single Short Ladies feature an elasticated waist as well as an attractive all over print and ..
Miso 4 Pack Full Briefs Ladies These Miso 4 Pack High leg Briefs are an essential to any woman's everyday wardrobe. . Made of 100% pure cot..
Miso 4 Pack High leg Briefs Ladies These Miso 4 Pack High leg Briefs are an essential to any woman's everyday wardrobe. Made of 100% pure c..
Miso Barely There Tights LadiesThese Ladies Miso Barely There Tights have been crafted with ultra sheer lycra for a smooth feel with a natur..
Miso Light Control Briefs LadiesThese light control briefs discreetly flatten your tummy and slim your hips while still providing the same c..
Miso Medium Control Briefs LadiesThese medium control briefs have been constructed to slim your waist, sculpt your hips and flatten your tum..
Miso Opaque 40 Denier 2 Pack Tights Ladies The Ladies Miso Opaque 40 Denier 2 Pack Tights feature a stretchy soft design with a 40 denier co..
Miso Opaque 60 Denier 2 Pack Tights Ladies The Ladies Miso Opaque 60 Denier 2 Pack Tights feature a soft, stretch construction with a 60 den..
Miso Seamless Bra LadiesThis lightly padded seamless bra is designed to provide a comfortable fit to suit women of all shapes and sizes. The..
Miso Sheen Tights LadiesThese Ladies Miso Sheen Tights have been developed with ultra sheer Lycra fibre with a delicate sheen, whilst the co..
Soulcal Racer Back Bralette Train in comfort and style in this Soulcal Racer Back Bralette, crafted with a racer back, a colour contrasting ..
USA Pro Medium Sports BraConquer your next workout with the Medium Sports Bra from USA Pro - this piece helps keep you cool and comfortable ..
Everlast Premium Short Briefs LadiesThe Everlast Premium Short Briefs deliver a lightweight, stretch fit with a branded elasticated waistban..
Firetrap Lace Briefs Ladies These Firetrap Lace Briefs are crafted with an elasticated waistband and a mesh body. They feature lace detail f..
SoulCal Crop Bra Ladies This SoulCal Crop Bra is crafted with crossover straps and a crew neck. It features an elasticated chest band for co..
SoulCal Lace Thong Ladies Update your lingerie collection with the SoulCal Lace Thong. Finished with an elasticated waist and lacy design, t..
SoulCal Plain Bralette This SoulCal Plain Bralette features an elasticated chest band for a secure fit as well as adjustable straps and Sou..
SoulCal Strap Bralet Ladies This SoulCal Strap Bralet is crafted with multiple spaghetti straps and a V neck. It features a an elasticated ..
Campri Baselayer Pants Ladies These Campri Baselayer Pants make for a practical wear, designed with an elasticated waistband, a heat retaini..
Campri Thermal Ladies Top This Campri Thermal Top is constructed with long sleeves and a crew neck collar for a classic, comfortable fit. 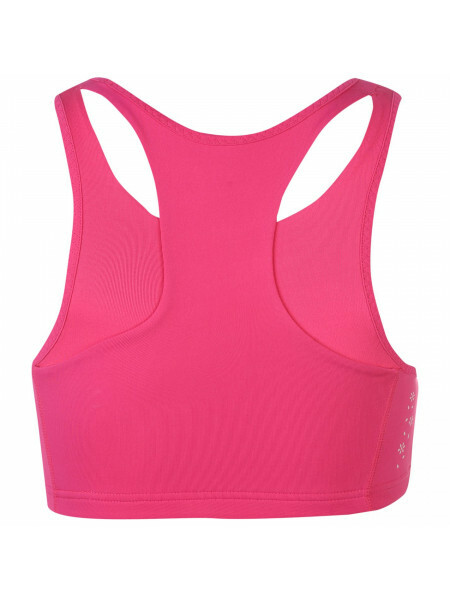 It..
Everlast Classic Bra LadiesThis Everlast Classic Womens Bra features a racerback design and an elasticated waistband for a comfortable fit.>..